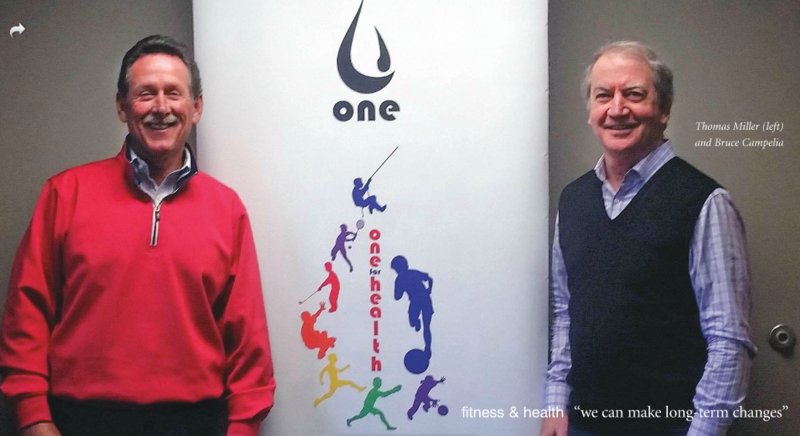 the founders of the One for Health Foundation, Thomas Miller and Bruce Campelia, are on a mission to change the health and economic stability of the country by educating children about the fundamentals of nutrition and physical wellness. Sound ambitious? It is. But Miller and Campelia are not the type of people to shy away from a challenge. They are lifelong athletes who know how to achieve their goals step by step, child by child. And with One for Health, they are already making an impact in the local community. Miller, a resident of Wellesley, and Campelia first met as teenagers at middle school in Weston. They stayed in touch through the years and almost six decades later they found themselves training together for a biathlon called the “Wildman.” (Their only goal for the event: survival). After one particularly grueling session that involved a bike ride and run up New Hampshire’s Wildcat Mountain, Miller and Campelia were enjoying a well-earned evening of recovery and relaxation. Sitting in two rocking chairs on a porch overlooking Lake Winnipesaukee, they started talking about how important health and exercise were to their lives. They talked about the epidemic of childhood obesity, the effect it was having on future generations, and the enormous financial burden it was putting on America. Finally, they talked about how they would like to do something to change the course of this problem and make a positive impact. Just a short time later, One for Health was born. Combining Miller’s background in advertising and branding with Campelia’s expertise in public health, the men started brainstorming both a name and a symbol that would represent the message that they hoped to send – that health is the one thing that matters. They landed on the idea of a single water drop, to represent not only the health benefits of water, but also the idea that a single drop of water can have larger ripple effects. Their ultimate goal is to roll their One for Health programs out nationally, but Miller and Campelia know that will not be an easy feat. “This is the hardest thing I’ve ever done,” says Campelia. “One for Health is a start-up, but it’s a nonprofit start-up. So we’re doing it the same way you do a start-up, with sweat equity, whatever time we have, and creativity. And we have such big dreams.” Still, Miller and Campelia never forget that the key to making their big dreams come true is focusing on the individual child. “This is a challenge we can win at,” says Miller. “We know that if even one person changes their health in a positive way, other people will be impacted by that and it will spread on its own.” Both men grow very serious as they reflect on this. “Even if I can make one positive change in a child, I can sleep at night,” adds Campelia.